More than 600 small business and 25 prime contractors are expected to visit Metro on Tuesday, February 25, to learn about business opportunities and to facilitate one-on-one conversations between small business and decision-makers from the construction industry. This a great opportunity for small business owners and prime contractors to network, market products and services and build relationships for future opportunities with some of the area’s leading contractors. 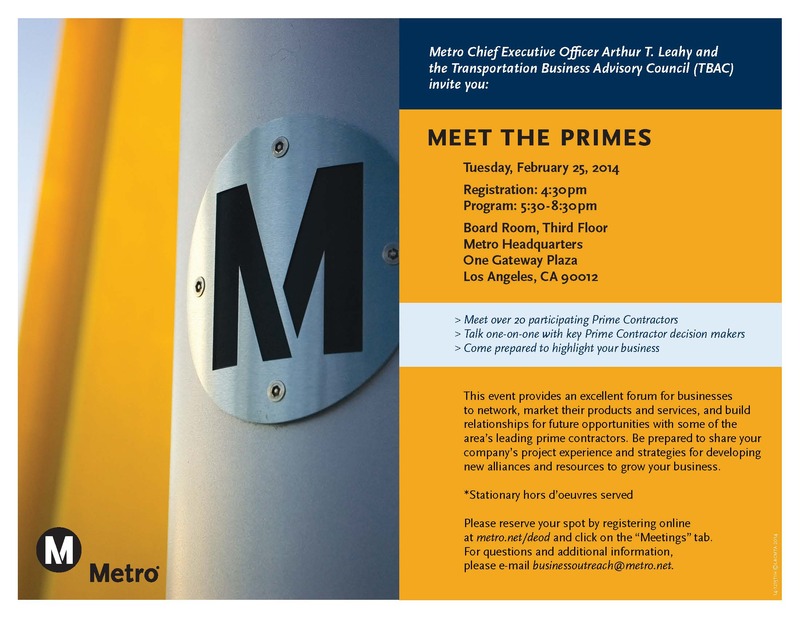 The mixer will take place on the third floor at Metro headquarters, One Gateway Plaza, downtown Los Angeles, 90012, from 5:30 p.m. to 8:30 p.m.
For additional information e-mail us at businessoutreach@metro.net or register online visit metro.net/deod and click on the “Meetings” tab. Yes!, there is pay underground parking with entrances at Vignes and Cesar Chavez. Metro won’t validate parking tickets. Is there a list of the 25 primes?